Calling All Rock N Rollers : Hinder is the hottest new band to grace stages today! Fronted by the charismatic Austin Winkler , Hinder has propled itself into the adoration of thousands of screaming fans with there hit Lips of An Angel. 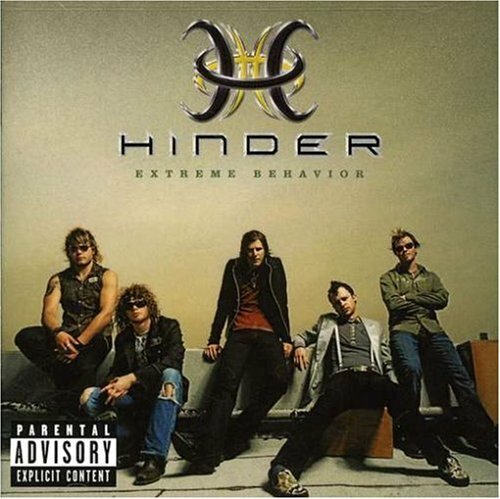 But Hinder digs deeper into emotional situations with songs such as Better Than Me and Heaven Sent. Winkler sings about broken hearts , shatterd relationships , and every emotion that most people are to scared to sing about. He does this all with moves borrowed from some of the greatest performers of our time, musicians such as Steven Tyler and Axl Rose. Austin sings his songs to the steady beat of drums provided by Cody Hanson, pounding bass riffs(Mike Rodden), and guitars(Joe"Blower" Garvey and Mark King) that cry in remenisence of the spirit of the 80'S, of wich Hinder is doing an excellent job of re-awakening , all in a voice that most guys would gladly suffer through a month and a half of double pneumonia to get. And the bad boys of Hinder aren't bad to look at either, particuallarly there frontman. Standing at 6 foot three , Austin sports dark brown hair and eyes that vary in color from green to blue to grey, with a dash of brown in some pictures. Thats right ladies, 4 different eye colors and 6 foot three ! Trust me, its worth the trip to Walmart to pick up one of there CD's , either Extreme Behavior or Take It To The Limit, you wont be dissapointed . Im a total Hinder-holic and I think they have some pretty amazing music .